Beautiful and delicate colour combination of polished Rose Gold and faceted, pear-shaped Morganite stones. One of the more unusual semi-precious stones, it has a pretty and sophisticated style. 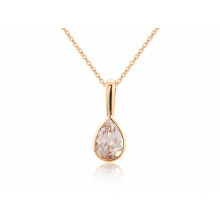 Look out for our other Morganite pieces to find matching and complementing Pendant Necklaces and Rings.